Become a member and receive loyalty discounts. It's free and it's our chance to thank you! Catchup with friends, grab a meal... sorted! A versatile venue for your events! that's when the best decisions are made! Watch the footy on big screen tv's. Catchup with mates over a beer & meal. Join Hump Club = even more offers! Drive through convenience on the go. We love food as much as you do! Parma's, burgers, steaks, seafood & more. Yes delicious vegetarian options too! Madden & Staff: Hospitality Engineers. Our menu caters for everyone! Upstairs, with our hospitality at your p/leisure! Stay and meet the locals. Pictured here our seafood platter! Our specials board always delights. Salmon, calamari, oysters and more. Madden & Staff: Hospitality Engineers! Contact us to organise in advance. Our menu & specials board will tempt. 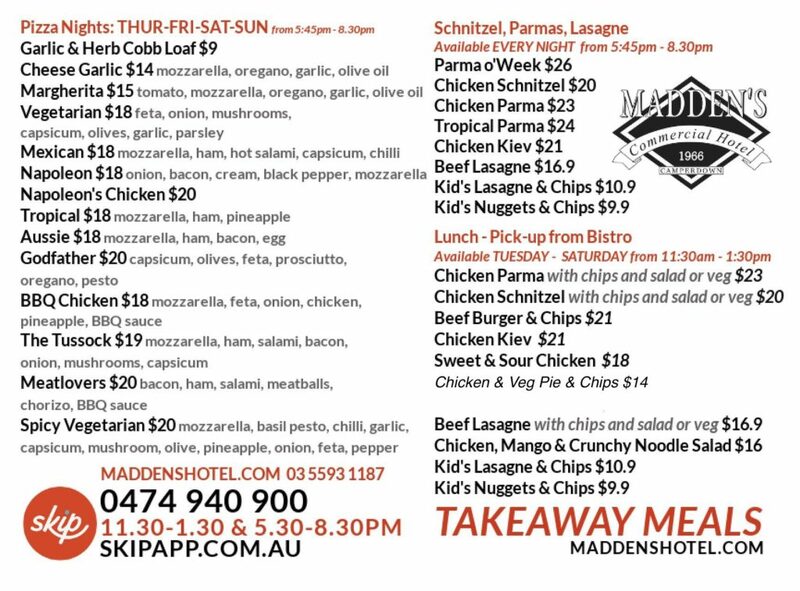 Parma of the week specials! On specials boards, dine-in or takeaway. Featuring great bands; local & imports! Visit and enjoy our beautifully renovated, classic country pub with its distinctive character; ambient settings, great facilities, quality service and excellent meals. Located right on Camperdown’s main street with its beautiful elm tree avenue, grand clocktower, delightful cafes, boutiques, antique & old-wares, secondhand and collectible shops. The town itself is home to numerous artists and active community groups so there’s always something happening be it concerts, theatre, film, studio openings, markets and more. 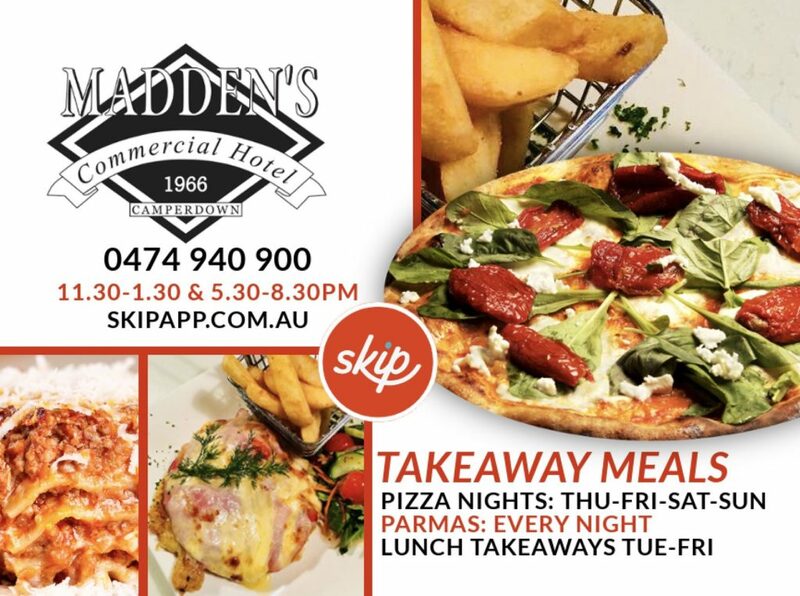 Legendary steaks & parmas, great vegetarian choices, kids meals & seniors deals. Something for the whole family; we love food as much as you do! Lunch from 12 noon, dinner from 6p.m. We have great seniors & kids meal options. Delicious thin crust pizzas also available. Our bistro provides takeaway options for those on the go. The Bistro really is a classic, with several bespoke features to look out for; the welcoming ships railing, the stained glass clad semi-private central room, a variety of wall features and front booths… are just to name a few! We have two smaller rooms just off of our main bistro, used for larger groups of 10+ or for meetings. Catch up with a few mates for a beer & watch the big screen sports TV’s. We love our tradies; enjoy classic parma’s, burgers, steaks, a mixed grill and more. We’ve small tables, bar seating and the option of two long tables of 20 in this area. We call it our Local Legend’s Bar as the walls feature photos and stories of Camperdown’s heroes. Thirsty Camel Exclusives for all! We offer an excellent selection of wines, beer, spirits, mixers & ice. A great way to stock up for parties or on the go to a mates. *Meeting (no meal) $50 room charge. *Meeting and all ordering meals, no room charge. *A booking fee may be charged for Dining Room or Tussock Jumpers to cover staffing, cleaning and preparation, dependent on numbers and use of the venue. There’s also a central room surrounded by stained glass feature, this has two tables of 10. Want an inclusive, relaxed informal space? Our back bar has the option of two long tables of 20. Our large sheltered courtyard provides a wonderful, casual extension leading out from, and to our main Bistro, Tussock Jumpers and The Legend’s Sports Bar. This area is popular for families and friends that are looking for a relaxed place to meet, eat and have a drink. We often have live bands performing in this area. Become and angel – take a photo, be transformed… we purchased local artist Merrian Dennis’ angel wings created for a local ‘insert angel here’ art installation, fun! Fantastic, flexible venue for your events; meeting rooms, venue spaces & diverse catering options for functions. we’ve got a menu to suit your needs and function spaces galore. In a space that can seat up to 95 this area is used for our bigger functions. More formal in presence and providing privacy. Having said that… this area can also be opened through to our courtyard and often becomes an extension to our courtyard events. It can also be split into two smaller sections depending on function needs. The dining rooms optional use of cinema style screen projector and surround sound p.a. system, along with its ability to fulfil diverse catering and its quiet privacy, makes this a popular venue option for corporate meetings and workshops. Our version of a snug! You really could be back in Ireland in this delightful dining space that sits just off of our main bistro. It has a romantic, old world ambience and seats up to 36. Our Old Timboon Restaurant is regularly opened for bespoke events. If you’re looking for a dining experience that feels discovered, intimate and unique please ask our staff if it is available for dining. Like having a bar in a shearing shed… without the sheep! With part wooden floor, tin roof, wood fire, wood-fire pizza oven and collectibles at every glance this unusual space really is a little piece of the Ettamogah! Used for weekends, private functions and events, it is full of country character. Loyalty membership cards are available, let us treat you! Main meal and drink discounts accrue, birthday vouchers given and monthly prize draws. Membership is free, *must be over 18. Have you tried the SKIP app? Included a continental breakfast served in the guest lounge. Rates: $50.00 per single and $70.00 per double or twin share, including GST. In keeping with country hotel accommodation, the bathrooms are shared between guests with 3 bathrooms being provided to service the fourteen rooms. There is a shared guest lounge with television and refrigerator. Good clean accommodation, centrally located, at an excellent price. Of course you will have our delicious dining options and bars on your doorstep! Come and stay, meet the locals! Click here to see images of our hotel accommodation and facilities. Our Foyer… also gets a mention! Leading into the Boudicca Bar & Accommodation Reception, the formal dining room and upstairs to our accommodation, this space is also worth a look. An elegant staircase illuminated by a chandelier reminiscent of The Great Gatsby era, and a small display from our local historical society sets the scene. Not only do we have the 2+ star upstairs pub accommodation, we also run Reception for The Camperdown Mill. Situated just a block away there are 11 beautifully renovated, self-contained apartments and guest houses! Click here to see our B'n'B hotel pub stay accommodation image gallery and to find out more about facilities. We had my daughter’s 18th b’day yesterday (14th April) in the Tussocks Room and it was fantastic and the guests have raved about how amazing the food was and a big shout out to Kate our server for the day. Thanks to Olivia for helping me organise things for the day. Amazing Steak with creamy garlic sauce. The atmosphere was awesome with good music and friendly staff. All in all a great night out. The only thing was there was no surf and turf option (prawns and calamari) to have on the Steak, otherwise we agreed that the commercial would have been the place to be! Had a weekend meal here, on Saturday. Meals were all done and on table in 30 minutes, fairly impressed with the service and staff. Food was good, excellent night all round. Thanks Olivia and staff, for an amazing Valentines Dinner. Food & Bubbles were wonderful, so was the service. Easter opening times for all areas of the hotel. That was my idea to have avacado on the parmi. Should also have pineapple. Espresso Martini AND Dessert ..
Espresso Martini’s now available in the Bistro! Dexter’s Special Pizza- Napoli and basil pesto base with: pumpkin, baby spinach, feta, sundried tomatoes, caramelised onions and cheese. Takeaway available !